Airspeed and Mach Number Indicator The airspeed and mach number indicator (fig. 7-8) displays the speed of the aircraft in relation to the air in which it is flying. In some instances, the speed of an aircraft is shown in Mach numbers. The Mach number of any moving body is its speed compared to the speed of sound in the surrounding medium (local speed). For example, if an aircraft is flying at a speed equal to one-half the local speed of sound, it is flying at Mach 0.5. If it moves at twice the local speed of sound, its speed is at Mach 2. Rate-of-Climb Indicator The rate-of-climb indicator (fig. 7-9) shows the rate at which an aircraft is climbing or descending. 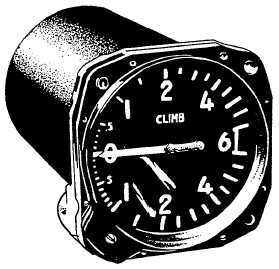 The case of a climb indicator is airtight except for a small connection through a restricted passage to the static line. Changes in atmospheric pressure move the operating mechanism that displays the rate of change. This change occurs only when the aircraft is ascending or descending. When the aircraft ceases to climb or dive, the airflow through the metering units equalizes and the pointer returns to zero. PRESSURE INDICATING GAUGES Electrical signals from a pressure transmitter activate a variety of aircraft instrument systems. Electrically activated instruments are usually in the form of small voltmeters with calibrated dials. These dials are calibrated to display a variety of conditions such as oil pressure, fuel pressure, and hydraulic pressure. Oil Pressure Indicator Oil pressure instruments (fig. 7-10) show the pressure of the oil. Drops in oil pressure (below normal conditions) signal possible engine failure caused by lack of oil. Fuel Pressure Indicator The fuel pressure indicator provides a check on the operation of the fuel system. It shows if fuel is being supplied steadily under the correct operating pressure. 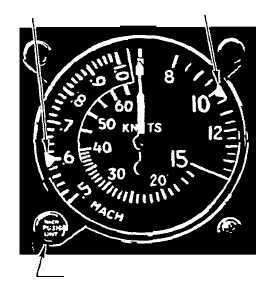 Hydraulic Pressure Indicator The pressures of hydraulic systems vary for different models of aircraft. 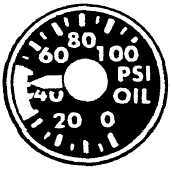 In most pressure systems, 7-8 ANF0710 Figure 7-10.Oil pressure indicator. ANF0709 Figure 7-9.Rate-of-climb indicator. INDEX ADJUSTING KNOB MACH LIMIT INDEX AIRSPEED INDEX ANF0708 Figure 7-8.Airspeed and Mach number indicator.